A young student is found stabbed, and her family hires Vares to investigate the case. Vares falls in love with a beautiful brunette - only to lose her in a horrible way. After dating Sole a few weeks, her body is found in a bird-watching tower. The Scandinavian "Mystery" genre is amazing. There are astonishingly good series that come out of Sweden, Denmark, Norway, and Finland. "Private Eye Vares" is one of them. And it is one of the best. 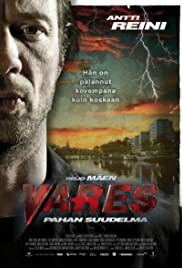 A number of "movies" in this series were made starting in 2011 (they're hard to find on IMDb; look for them under lead actor Antti Reini; someone else played Vares prior to Reini -- I've not seen those). A new movie is in the works, apparently, as I write this in 2014. These are very, very noir, very hard-boiled, down to the Sam Spade-like voice-over in first-person narrative (is it me? I could listen to the sound of Antti Reini's voice endlessly -- although I don't understand a word of Finnish). It's a modern-day Dashiell Hammett. But there is also a lot of humor here, and the humor translates well for the English-speaking audience. There's really nothing more fun to watch than Antti Reini as Jussi Vares. But let's not stop there, all the actors -- all the characters -- are wonderful. Jussi's band of brothers includes a former pastor who now owns a bookstore (Pastori Alanen, played by Matti Onnismaa), a writer of bad fiction novels (Juhani Luusalmi, played by Eppu Salminen), a tabloid journalist (Ruuhio, played by Mikko Leppilampi), and a police homicide investigator (Komisario Markku Hautavainio, played by Ilkka Heiskanen). They're mostly a group of adorable, loyal, well-meaning, and clever, if scuzzy, drunks. I especially enjoy Inspector Hautavainio. Other equally captivating characters come and go... like Anna (played by Maria Järvenhelmi), she's Jussi's neighbor -- a taxi driver by day, a pole dancer at night. And let's not forget "Antidote" (played by the wonderful Jasper Pääkkönen) -- who seems like a creepy, small-time crook, but is still sympathetically appealing.. and maybe not as bad as he seems. It's a dark world that Vares and his pals occupy. But they are fun to watch! And the music! The music is amazing, in movie after movie it mesmerizes. I especially enjoyed the soundtracks in Tango of Darkness and The Path of Righteous Men. Who would've known the Finnish are gaga for Tango?